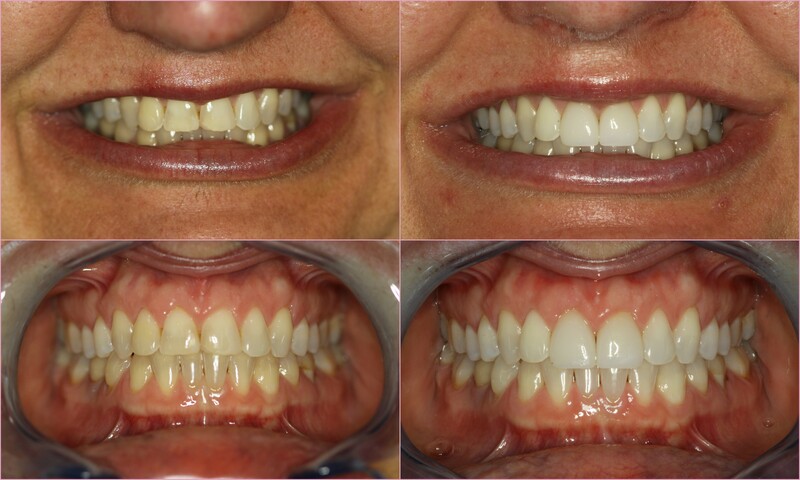 Our June cosmetic dentistry before and after case of the month profiles a patient who has wanted to upgrade the bonding on her two front teeth to porcelain veneers for several years. Her only concern was that only having two veneers would look unnatural, and they would stand out against her other teeth. For this reason, she sought out Chicago cosmetic dentist, Dr. Jessica Emery and the team at Sugar Fix Dental Loft, to ensure her long standing want was carried out flawlessly. The original bonding existed as a result of trauma to her front teeth and according to the patient, never really replicated her original smile, which she liked very much. Furthermore, years of clenching and grinding had significantly reduced the length of her two front teeth, making them virtually invisible when her lips were at rest. Since she was so fond of her teeth prior to the trauma and bonding, we requested she dig up some old photos to help us out. We also recommended she professionally whiten her teeth with KOR whitening. KOR whitening is by far the most sophisticated whitening product on the market and made a tremendous difference in the shade of her teeth. We cannot stress to our patients enough the importance of professionally whitening their teeth prior to making any investment in cosmetic dentistry, since we match the shade of the porcelain veneers or crowns to the shade of their natural teeth. If you’re going to go for it, you may as well go all out! After she completed the KOR whitening, we took impressions for a diagnostic wax up, which is basically a prototype of the smile makeover. This allows patients the opportunity to view their smile makeover outside of their mouth and ask any questions before we begin the makeover process. We provided our laboratory with the old pictures she dug out and communicated her goals. The diagnostic wax up also provided us with a template to create the provisional veneers she wore while the lab fabricated her final veneers. We delivered her porcelain veneers two weeks after presenting the wax-up and prepping her teeth. Because much of her tooth structure was already lost, we were able to be ultra conservative in our preparation, removing very little natural tooth structure. We had our laboratory technician on hand the day of the delivery in the event any custom shading was required after we saw the restorations next to her natural teeth. In this case, thanks to the use of a digital SLR camera, the shade was a dead match and no further shading was required. Simply said, she looks amazing! If you or someone you know is interested in cosmetic dentistry, contact Chicago Cosmetic Dentist, Dr. Jessica Emery and the team at Sugar Fix Dental Loft. Smile makeovers come in all different shapes and sizes, but we nail it every time!